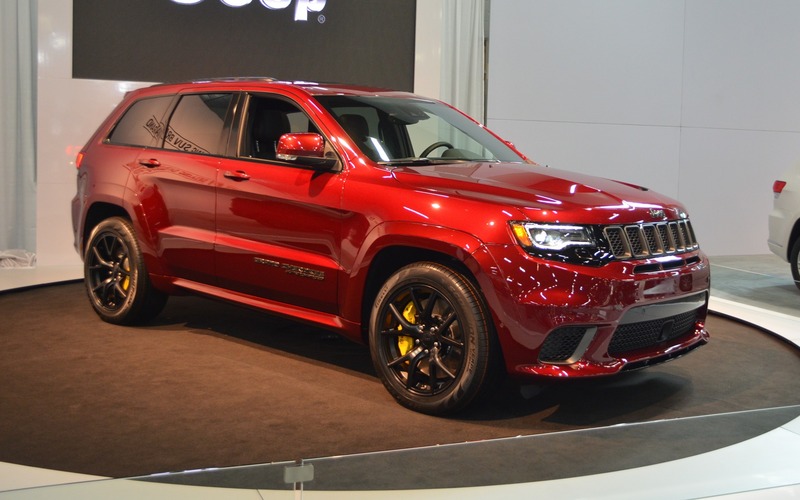 Three weeks ago at the New York Auto Show, Jeep introduced the Trackhawk, a Grand Cherokee equipped with the same Hellcat engine used in the Dodge Charger and Challenger. The Trackhawk made its Canadian debuts at the Edmonton Auto Show, the last show of the 2016-2017 season. This Hellcat is a 6.2-litre supercharged V8 with 707 horsepower at 6000 rpm and a torque rating of 645 lb.-ft. at 4800 rpm. Even though the Trackhawk weighs 2433 kilograms, this engine can launch it from 0 to 100 km/h in 3.5 seconds, according to Jeep. However, the noble brand “forgot” to provide its fuel consumption figures. It’s a safe bet though that the 93.1 litres in the tank will quickly evaporate if you get your kicks doing 0-100 km/h sprints. Also: 2018 Dodge Durango SRT: Pricing Announced! The eight-speed automatic gearbox is paired with the 4x4 Quadra-Trac system and there are several available driving modes: Auto (40% of the torque is sent to the front and 60% to the back, may vary depending on the road conditions), Sport (35% of the torque to the front, 65% to the back and shift time is cut in half), Track (30% to the front, 70% to the back and a shift time of 160 milliseconds, or 68% less than in Auto mode), Tow (for towing, of course, 60% to the front, 40% to the back) and, finally, Snow (50%-50%). Since its name refers to a race track, don't expect the Trackhawk to be in its element off road. The approach angle is 18 degrees, the breakover angle is 18.4 degrees and the departure angle is 23.1 degrees. On a basic Grand Cherokee, these figures are 26.2, 19 and 24, respectively. To put that in perspective, the angles for a Jeep Wrangler Rubicon, the king of off-roading, are 42.2, 25.8 and 32.3. The Trackhawk will never be mistaken for a Rubicon on mountainous terrain. Then again, it can tow up to 7200 pounds (3266 kilos). And you can take comfort in the fact that a Rubicon would be totally, utterly and hopelessly lost on a race track. Besides its incredible engine, the Trackhawk also features an independent front suspension and a multi-link rear suspension whose components, many of which are aluminum, are adapted for racing. The immense Pirelli Scorpion Verde P295/45ZR20 tires obscure the six-piston front and four-piston rear Brembo brakes. The Jeep Grand Cherokee will arrive in dealerships in the next few months and sell for approximately CAN$100,000. Much to the dismay of environmentalists and despite the fact that we can all agree that a 707-horsepower SUV is totally useless, it will sell like hotcakes. If you want one, consider putting your name on the waiting list—stat! The Trackhawk is already a classic that will be worth a fortune in a few decades. News 2018 Dodge Durango SRT: Pricing Announced! The all-new, high-performance version of the midsize Durango SUV will be on sale in Canada during the fourth quarter of 2017, and its MSRP has just been revealed. The 2018 Dodge Durango SRT will be offered at a starting price of $72,495, before adding freight and delivery charges of $1,795.